So first a little background. 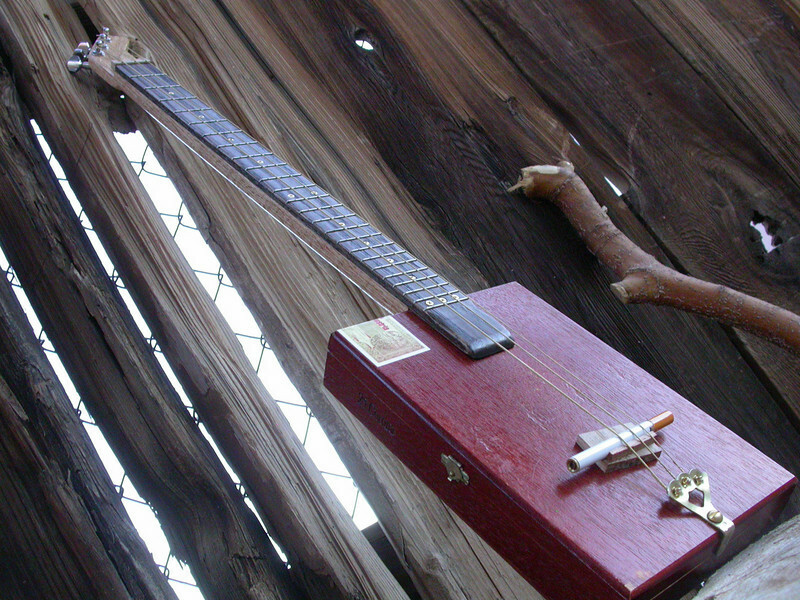 Back in their first year Make Magazine ran an article on an electric cigar box guitar. 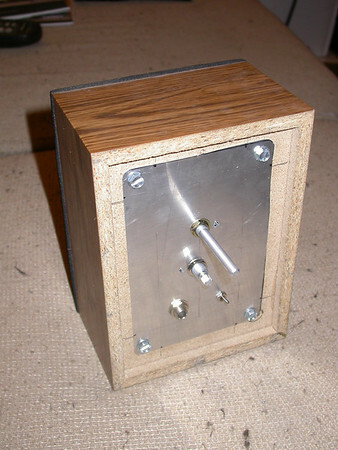 It was strung with masons line and used a piezo element for a pickup. I was intrigued. But I can’t play guitar and don’t have an amp. So it was filed away as something for another day. 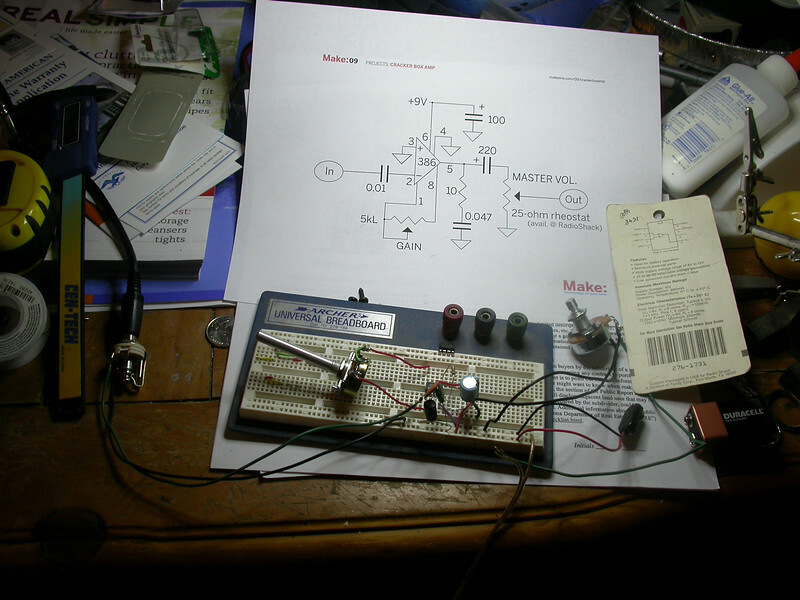 And sure enough a few issues latter Make ran an article on how to make a cheap amp out of a LM386 audio amplifier chip. 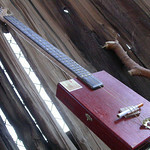 My first cigar box guitar! It was strung with masons line as the Make article suggested. 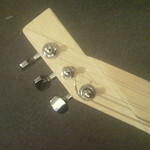 I experimented with nails held on with rubber bands for frets like the article used…but found it easier to play fretless. Not that I could actually play anything. 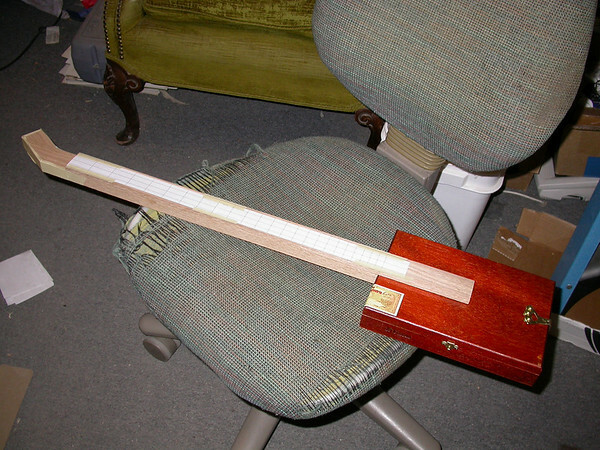 I also had a heck of a time trying to get it into any kind of tune and within a few days found a number of online cigar box guitar sites and learned just what was possible. 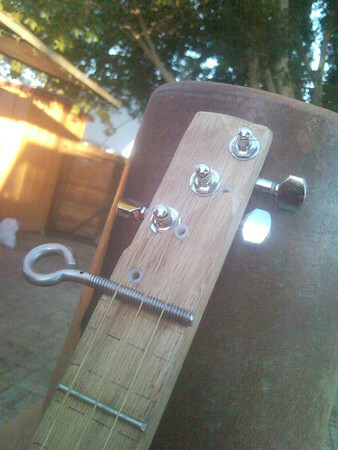 I ended up replacing the twine with actual guitar strings fairly quickly, then modifying the eye bolt tuners to try and get them to hold the tension of the real strings. But it just wasn’t working well. 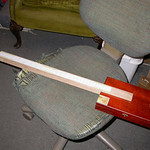 Plus the tension of the strings was starting to warp the neck. So I never really liked it enough to really learn to play it. A few friends who already knew how to play guitar did manage to crank out some actual music with it though so I knew the potential was there. And eventually (this past November) I ended up getting some actual tuning machines for it and suddenly it was playable enough I started to get interested in it again. 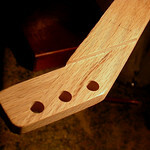 I even cut up some cotter pins and made frets for it. The neck was still warping worse and worse but I was actually able to start learning how to play it successfully for the first time. 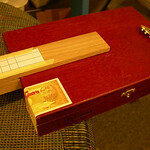 And about that same time my friend J mentioned he had an empty cigar box if I wanted to try and build another. It took awhile for us to get together and to finally get my hands on the box, and at first I wasn’t very hyped about it. It was very plain, in a reddish brown color that didn’t call out to me, and it was built differently than most cigar boxes. But it was nice thin real wood, and did ring nicely when I knocked it with my knuckles. Besides I still had 3 tuners left over and was itching to build! 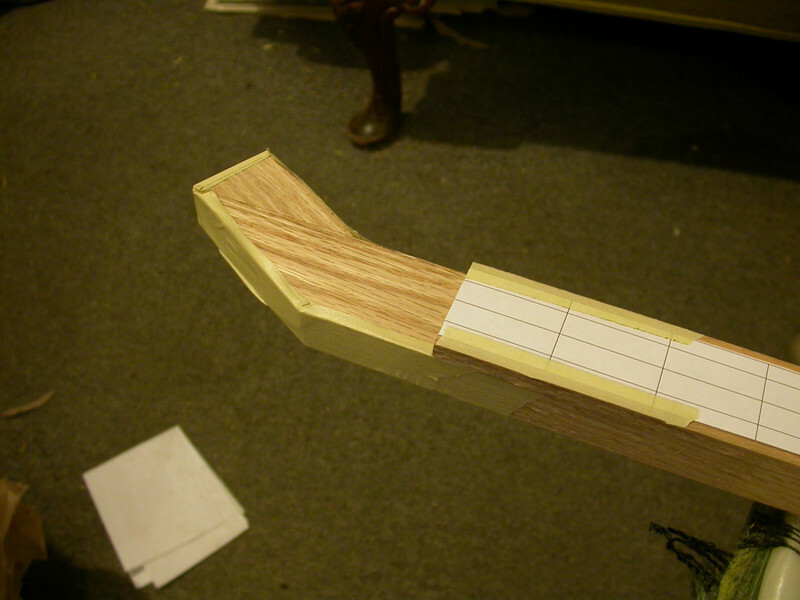 So on the way hope I stopped and picked up some red oak to make a neck, and a smaller piece to make a fingerboard. The color of the box was starting to give me ideas. I also looked through every home improvement store in town looking for little brass hinges or other things that might make a nice tail piece to make mounting the strings easier. I bought a couple hinges but ended up not using any of them. 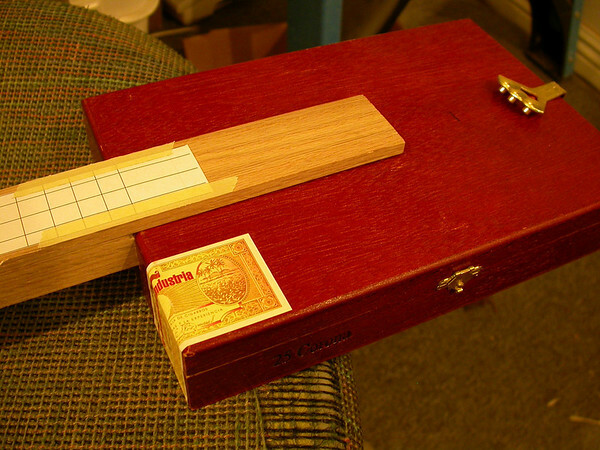 My first attempt at using real tuners on the first CBG was very rough and I wasn’t 100% happy with how it came out. 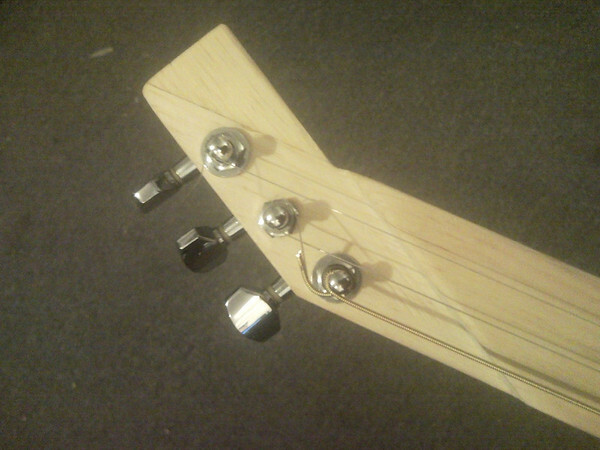 There wasn’t enough break over the nut even with the tuners cut in like that, the tuners weren’t positioned very well at all. But it did give me ideas and inspiration for another idea on how to do the head. Not wanting to waste the one chunk of oak I had on hand I decided to test my idea on a piece of cheap pine first. I did burn the oak a little on the blade of the table saw, most of it sanded out but some is still visible. 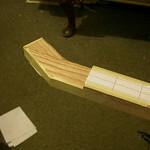 While waiting for the glue on the head joint to dry I worked on the fingerboard. The first box had an absurdly long scale length since it was meant to be used with the masons line originally and I never got around to shortening it up. It also had way too much action making it VERY difficult to play without a slide. So this time I knew I wanted to have lower string action and a shorter scale. 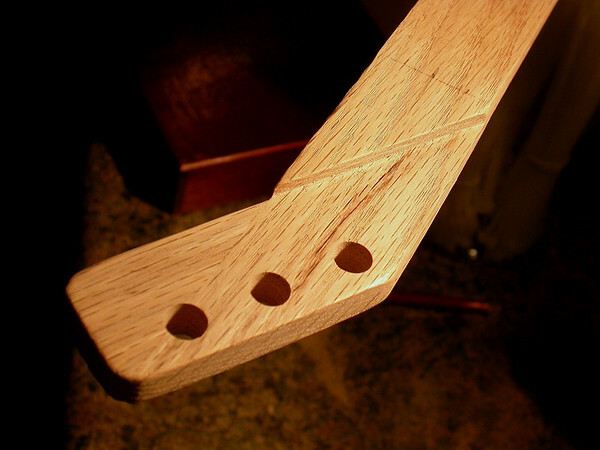 I figured using a fingerboard on top of the neck would help get better break over the nut and bridge while enabling me to set the action up nice and low. 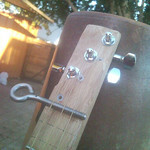 I also planned on using real frets this time so with a separate fingerboard if I messed up I just had to make a new fingerboard and not a whole new neck. But it’s time for me to start thinking about making dinner, and this is getting to be a fairly long post so I’m going to leave it hanging here until I get a chance to update again. It probably won’t be tomorrow night (we’ve got brew night) and it probable won’t be for a few days after that since Kieth is supposed to be in town for a few days starting any day now. But just like I finally got around to starting this story I promise I will get around to continuing it. I need to finish it up soon too, CBG #3 and #4 are already under construction and I’d rather be talking about them right now. 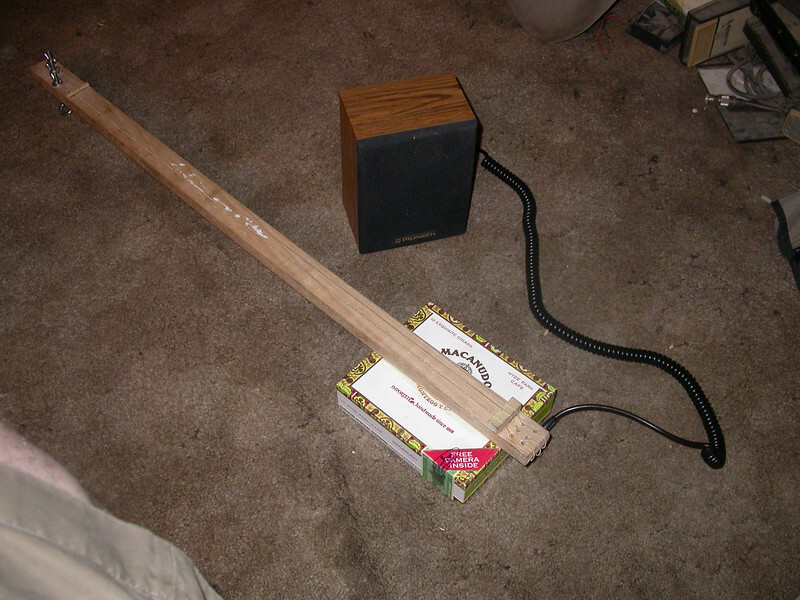 This entry was posted on Wednesday, March 10th, 2010 at 9:12 pm	and is filed under diy, music, projects. You can follow any comments to this entry through the RSS 2.0 feed. You can leave a comment, or trackback from your own site.